By all accounts, John of England was a dreadful king. During his reign, he lost virtually all the French territories his mother Eleanor of Aquitaine brought to her marriage with King Henry II. He spent most of his reign trying to gain them back. In the meantime he alienated the English barons so much they cornered him on the plain of Runnymede in 1215 and made him seal the Magna Carta, the Great Charter, forcing him to give up some of his rights as king. And he was a terrible husband. His style of dealing with his wives and rich heiresses took the meaning of maltreatment to new heights. John was the favorite son of his father who took to calling him “Lackland”. King Henry II had ensured his three oldest sons would have land holdings after he died, dividing England and the French territories between Henry the Young King, Richard (known as Lionheart) and Geoffrey leaving nothing for John. In an effort to gain lands for John, a plan was proposed to marry him to Alice, eldest daughter of Count Humbert of Maurienne, in what is now northern Italy. Unfortunately, Alice died before the wedding could take place. When Henry the Young King rebelled against his father, part of the settlement ending the rebellion included giving a castle and a lordship from his inheritance to his brother. A few months later, the earldom of Cornwall became available and John was given the title. Additionally, a betrothal was arranged in 1176 between John and his cousin Isabella of Gloucester, heiress to an immense earldom on the Welsh Marches. John and Isabella were great-grandchildren of King Henry I of England. This made them related within the third degree of consanguinity which prohibited them from marrying according to canonical law. The usual way to get around this obstacle was with a dispensation from the Pope. Isabella was born c. 1160, third and youngest daughter of William, earl of Gloucester and Hawisia, daughter of Robert de Beaumont, 3rd earl of Leicester. Earl William was one of the wealthiest nobles in England. Sadly we know nothing of Isabella’s upbringing or education. Isabella’s brother Robert died in 1166, leaving her and her two sisters Mabel and Amicia her father’s heirs. The usual custom dictated that the earldom would have been divided between the three women. Earl William had a troubled relationship with Henry II but for the most part remained loyal to him. He agreed for his remaining unmarried daughter Isabella to marry John on September 28, 1176 at Windsor. The earl also agreed to make John the heir to Gloucester giving Mabel and Amicia annuities of £100 each in return for giving up their inheritances. Henry also agreed if the Pope failed to issue the dispensation for the two cousins to marry, he would arrange an appropriate marriage for Isabella. If Earl William were to have a surviving son, that son would split the earldom with John. Isabella’s father died in 1183. As she was still unmarried, King Henry took over her wardship and enjoyed the income from her holdings until his death in 1189. After John’s brother Richard became king, he was made Count of Mortain in Normandy and he finally married Isabella on August 29, 1189 at Marlborough Castle, Wiltshire. Archbishop Baldwin of Canterbury was appalled John had married his cousin without papal dispensation. He forbid them to cohabit, cited John to appear in his court and laid interdict on his estates when John didn’t appear and continued to co-habit with Isabella. John appealed these restrictions to a papal legate who was in England at the time and got them removed by promising he was in the process of seeking the proper paperwork from the Pope. However, he never obtained what was needed. Archbishop Baldwin died early in the process of appeal to Rome and nobody followed up to get the marriage declared valid. Sometime during 1190-1, Isabella and John visited Normandy and issued charters together. But by 1193, they appear to have been estranged, most likely due to Isabella’s failure to have a child. Also in 1193, John considered getting out of his marriage with Isabella to marry Princess Alys, sister of the French king who was originally supposed to marry his brother Richard. He considered an annulment of his marriage again in 1196. When King Richard died in 1199, John became King of England and his prospects were significantly altered. Isabella was not crowned with John in May. He began in earnest to demonstrate great interest in a more dynastic marriage but his prospects were complicated by the fact that he was already married. His wife of ten years had played no part in his reign and possibly not in his personal life either. She had no children and made no appeal of John’s decision for an annulment. It’s also possible John bought her off. In true medieval fashion, the marriage could be annulled or they could be divorced due to the fact that they were related. They had never acquired the necessary paperwork from the Pope. The matter of the validity of the marriage was taken to three Norman bishops and then to three bishops of Aquitaine. These bishops declared John a free man. No formal divorce or annulment was ever obtained. This state of affairs left Isabella an unmarried heiress and John took her estates into his own wardship. Isabella maintained her own household in Winchester which cost the king eighty pounds per year and he made gifts to her, appearing to maintain a civil relationship. In 1200, John married Isabelle of Angoulême, who was anywhere from nine to twelve years old. John forced Isabella to take his second wife into her household and care for her in 1206-7. After Queen Isabelle gave birth to her first son Henry in 1207, Isabella was removed from Winchester to Sherborn and her allowance was reduced to fifty pounds per year. The difference of thirty pounds may have been paid to Isabella for the upkeep of the young Queen Isabelle. In 1213, Isabella’s nephew died, leaving her the sole survivor to the Gloucester estates. Isabella drew up a will that year with instructions on disposing her moveable goods. But then her fortunes changed dramatically. King John was raising funds to fight for the return of his French estates. In January of 1214, he announced he had sold Isabella’s wardship to Sir Geoffrey Mandeville, Earl of Essex, for twenty thousand marks, possibly against Sir Geoffrey’s will. Isabella and Mandeville were married. Mandeville was compelled to make the huge payment within a year and when he defaulted on the debt, John confiscated her estates once again. John restored the domains with an offer to renegotiate the debt but Isabella and her husband joined the rebel barons against John in 1215. Mandeville died on February 23, 1216 of wounds he suffered in a tournament and King John died on October 19 that same year. For the next year, Isabella enjoyed the most freedom of her entire life as a widow and countess of Gloucester and Essex in her own right. She issued charters and gave gifts to religious houses. However, she was married once again in the fall of 1217 to Hubert de Burgh, one of the regents of John’s successor, his son by his second wife, King Henry III. On October 14, Isabella died, probably at Keynsham Abbey, near Bristol. 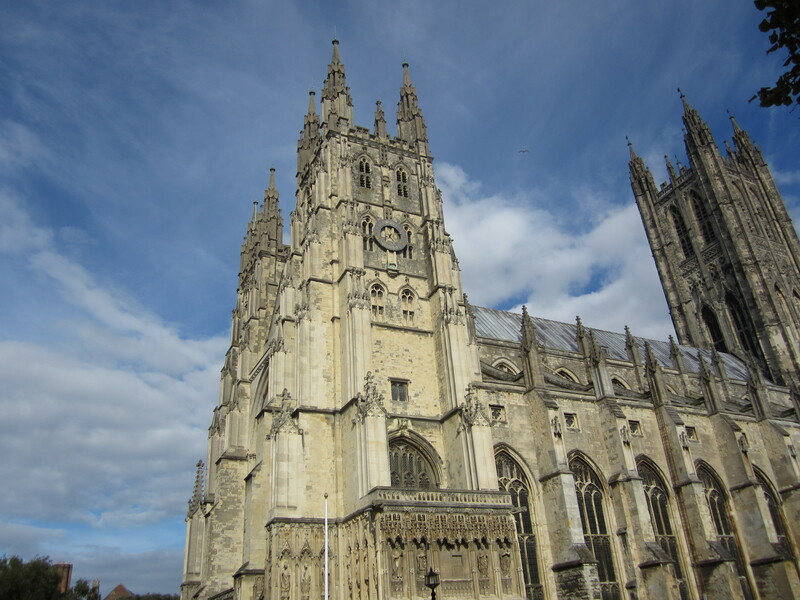 She was buried at Christ Church, Canterbury.